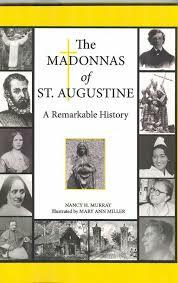 The Madonnas of St. Augustine: A Remarkable History. Author: Nancy H. Murray. Hart Street Publishers. 2013. 106 pp. Using antique statues of the Blessed Mother as windows into the eras of their creation, Nancy Murray has written a compelling history of the beautiful, historic city of St Augustine. The delicate, classically crafted Nuestra Señora de La Leche y Buen Parto (Our Lady of the Milk and Happy Delivery) midwifed the city’s founding under generous Spanish Franciscans. Two depictions of the Blessed Mother, one under the forbidding title of The Hurricane Lady and another Virgen de la Caridad del Cobre (Virgin of Charity from Cobre), comforted an abused immigrant community that was eventually driven from the area. And lastly, a rustic wooden carving called the Pregnant Madonna helped to tell the story of Florida’s freedmen, struggling to take their place in society. Founded in 1565, St. Augustine, Florida holds pride of place as the country’s oldest European-based city. Its first settlers included people of great piety and idealism, who brought La Leche Madonna from Spain as part of their patrimony. Over the next hundred years, missions blossomed and small communities attempted to survive under difficult conditions. The issue of slavery proved to be pivotal. During the early 18th century, “British colonies supported the practice of slavery while the Spanish established Fort Mose, the first legally sanctioned African American community of free men approximately two miles north of St. Augustine.” The enraged British burnt St. Augustine to the ground, destroyed the missions, enslaved Indians, and scattered the Spanish settlers, most of whom fled to Cuba. The Virgen del Cobre was fished out of the Cuban waters under demoralized circumstances that certainly seemed to be an act of providential solace. Meanwhile, the statue that came to be known as The Hurricane Lady accompanied a band of Catholic immigrants from southern Europe who had been seduced to work the land around St. Augustine under unspeakably cruel conditions that took years to remedy. She also seemed to carry Heaven’s message of mercy and watchful care. 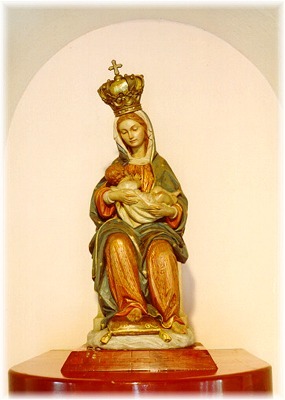 The Pregnant Madonna dates back to 16th century Belgium but makes her appearance in late 19th century St. Augustine, traveling with the French Sisters of St. Joseph. These Sisters came to the United States to educate the newly freed southern slaves despite tremendous opposition and hardship and managed to establish seven St. Joseph Academies within a ten-year period. Spero columnist Stephanie Block also edits Los Pequenos newspaper of New Mexico.